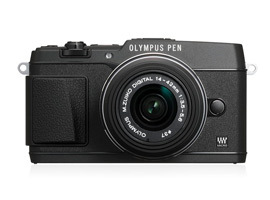 Olympus PEN E-P5 review: Is it mightier than the rest? Last year saw the introduction of the Olympus O-MD E-M5, with a nod to firm’s film-era cameras but packing an new 16-Mpix MOS type sensor on an advanced ‘5-axis’ stabilized platform, built-in EVF, weatherproofing, high speed AF and 9fps continuous shooting, it became a sensation practically overnight. The new $999 (body only) E-P5 looks to capitalize on that using the familiar PEN body shape instead and by adding a sprinkling of promising new features, including focus ‘peaking’,1/8000 sec top shutter speed (and 1/320 sec flash sync), built-in intervalometer and time lapse movie creation option, as well as Wi-Fi for remote shooting and image transfer to a smartphone or tablet. Although the E-P5 lacks a viewfinder, it has a 1.04m dot 3-inch LCD touchscreen display with tilting mechanism, the firm also announced a new optional finder for it. Although an extra $279, the VF-4 has a new 2.36M dot LCD, proximity sensor and 1.48x (0.74 equivalent) magnification. 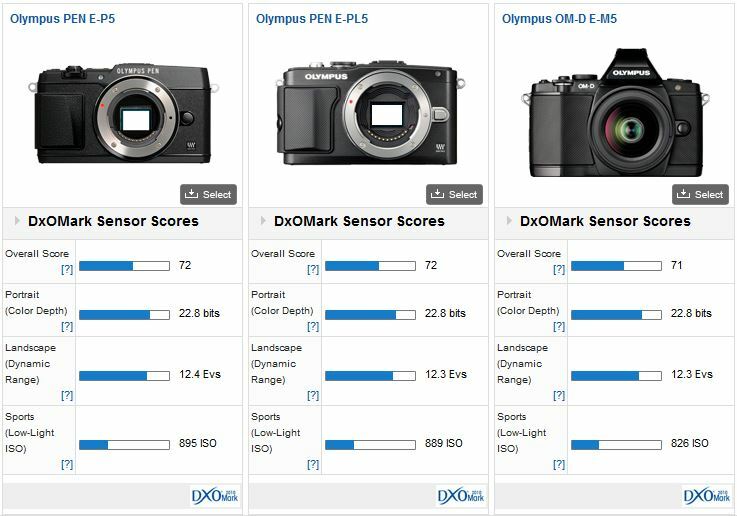 A DxOMark Sensor score of 72 points is one of the best scores from a MFT camera, and in our rankings comes 61 just ahead of some recent APS-C models such as the Samsung NX210 and Canon EOS 100D /SL1 but just behind some of the best of the older APS-C models such as the Pentax K-r and K-x. With the Color Depth at 22.8 bits and a Dynamic range of 12.4 Evs, that’s a great performance against a sensor that’s around 65% larger by surface area. 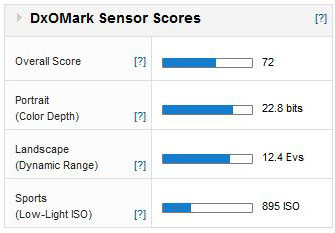 The one area where MFT sensors generally concede some capability to the best APS-C CMOS sensors is in their low-light performance, where the E-P5 achieves a low-ish score. That said, the E-P5 can still out-perform some APS-C models in that regard, such as the Canon EOS 700D / Rebel T5i, for example, which achieved a 681 ISO rating in our recent tests. Against the top of the range $1,299 (body only) Panasonic Lumix DMC-GH3, the E-P5 achieves practically identical scores for each use case, it strongly suggests that the two models share the same sensor unit, albeit with the Olympus showing some slight improvement (less 1/3 stop) in low-light performance. 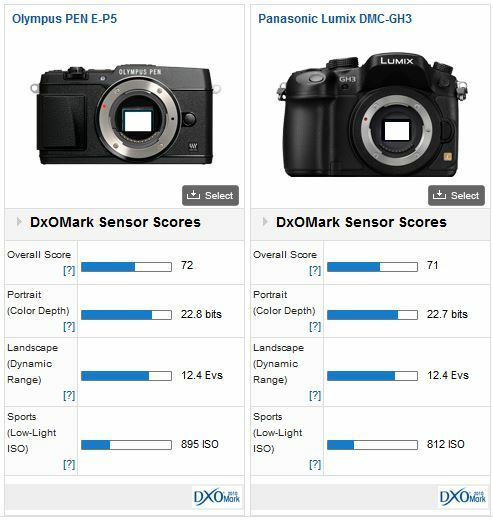 Even with an increase in pixel count (up from 12.3-Mpix to 16.1-Mpix) the E-P5 shows a substantial increase in imaging performance against the firm’s older PEN E-P3 model. At base ISO, the new sensor shows an improvement of +1.3 stop in color depth, a healthy +0.7 stop gain in low light and impressive +2.3 stops wider dynamic range. 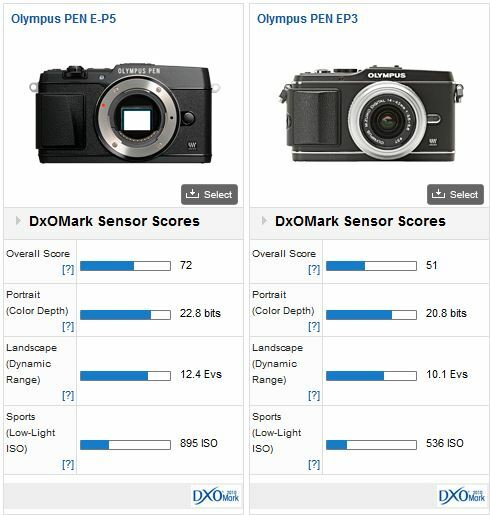 If you’ve been following our reviews of the PEN E-PL5 and OM-D E-M5 you’ll know that the two appear to share the same sensor and from the results of the E-P5 it appears Olympus is using the same unit again, albeit with some slight optimization of low-light performance.While the sensor is a proven performer, it is perhaps slightly disappointing that the firm hasn’t chosen the flagship PEN to showcase something new. As the new top of the range PEN, the E-P5 has a good balance of features, best build of any PEN models to date and the best performing MFT sensor currently available. However, models such as the Nikon D7100, which adopts a new sensor, and, to a lesser extent, the Ricoh GR and Nikon Coolpix A, with their older sensors,all out-perform the E-P5 in low light. With the market moving towards smaller, highly portable cameras featuring APS-C format sensors, Olympus needs to constantly reassert the advantages of the MFT format.